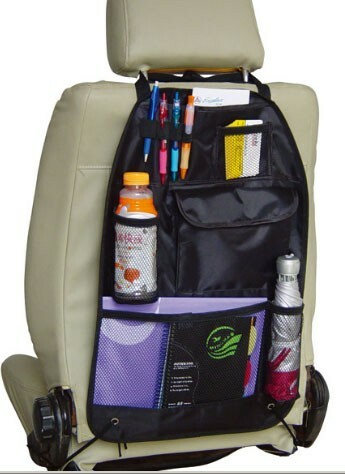 DELUX CAR SEAT ORGANIZER KEEPS YOUR CAR INTERIOR ORGANISED! STORES - PENS - MAPS - BOTTLES - MAGAZINES - RECEIPTS - UMBRELLA - BABY ITEMS - TOOLS THE LIST IS ENDLESS! No more Clutter, no more mess Is your glove box bursting full ? Do you still stuff receipts in your side car pockets? Present a professional organised image even if you dont fill it up - it shows you like being organized and everything to be in order! An amazingly simple but very useful product well worth its price! Very Simple and Easy to fit in Seconds!! Simply attached to the headrest on the front seat/s with straps (provided) Why not get two for your car or buy some for your friends - makes a nice gift!